MASK REMOVED: OIC STATES REJECT DEBATE ABOUT VIOLENCE TOWARDS HOMOSEXUALS…….. – The Tundra Tabloids……. 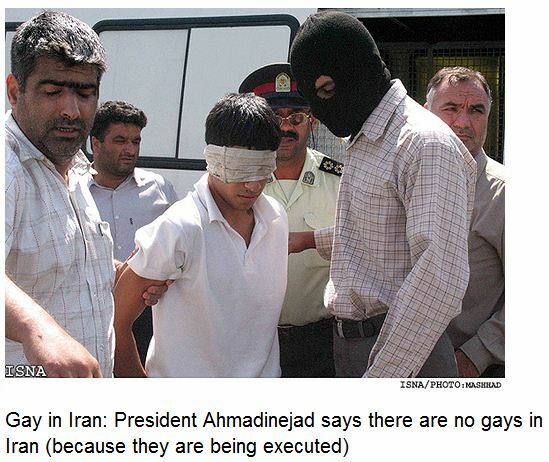 MASK REMOVED: OIC STATES REJECT DEBATE ABOUT VIOLENCE TOWARDS HOMOSEXUALS…….. Whether you have positive or negative views on homosexuality, this is a matter of individual liberty and freedom, the right to live one’s own lifestyle. Tyranny assumes many models and guises, it can also be correctly said that gay rights activists, feminists, and any other single issue ‘rights’ group can be as tyrannical as the next, so this serves as a warning to anyone wishing to impose your values upon another. That said, the OIC stands heads and shoulders above all other groups trying to intimidate and force others to succumb and submit to their 7th century sensibilities. Here we see the rubber hit the road, hopefully it will galvanize minorities to resist aligning themselves with intolerant Islam. Nothing like a smack upside the head to bring some people to their senses. The Islamic statement, obtained by the Geneva-based human rights group UN Watch and posted on its website, is provoking sharp reactions from human rights activists. Previous Post Previous Post BRITISH MUSLIMS RECRUITED TO FIGHT FOR AL-QAIDA IN SOMALIA……. Next Post Next Post PALLYWOOD EXTENDS IT’S INFLUENCE TO THE SYRIAN OPPOSITION……. The simmering conflict between what liberals have shoved down everyone’s throats for decades and what they now have to confront because of their propping up of islam is coming to a boil. Pass the popcorn. When conservatives finally ascend, I wonder if the Dems will magically switch back to their original lefty positions? I’ve noticed that Muslim Brotherhood front organizations like CAIR, et al are hedging their bets by on the one hand supporting OWS, demanding special privilages in workplaces and schools, and supporting muslim offenders no matter how heinous the crime, and on the other hand running for state and local offices, financially supporting Republican useful idiots, and infiltrating the American Conservative Union. Clever guys.